Our Tudor arched pedestrian gates, fit for a King or Queen. Pictured in Meranti (Hardwood). A Tudor arched headed gate fit for a King (or Queen!). 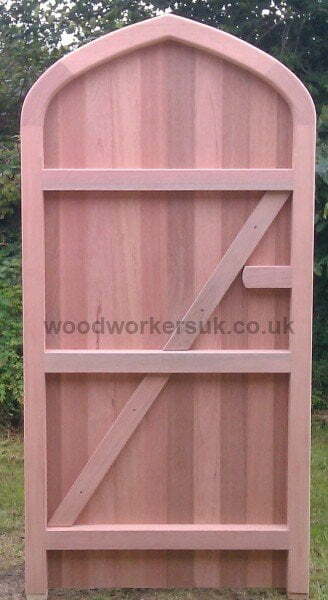 Shown in Meranti (Hardwood) our stunning Tudor arched gate is a byword for elegance. With a full thickness head that is based on a four centred arch, our Tudor arched gate is a gate that will certainly turn heads and have people talking for all the right reasons! Made to measure to suit your requirements in Hardwood only (Meranti, Idigbo and European Oak) and Modified Accoya Softwood, the Tudor arched pedestrian gate can be manufactured to suit your home and is the ideal gate to suit either a Tudor arched opening within a wall or as a stand-alone side access/pedestrian gate. Fancy something a bit different for your home? Why not give the Tudor arched headed gate a try? The Tudor arched gate is made to measure in overall widths up to 3ft 6/1016mm wide. 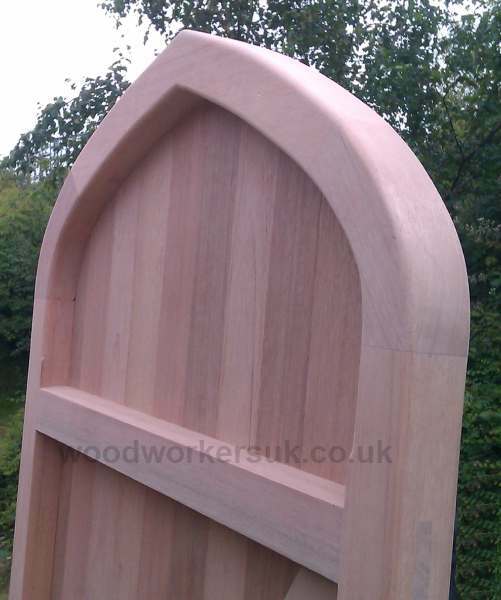 If you are intending to fit the gate within an existing Tudor arched opening, then please contact us with your individual requirements as we can manufacture something to suit your current openings – though we may need a template or pattern of the top of the gateway to ensure the perfect finish. A matching Tudor arched frame can also be manufactured. 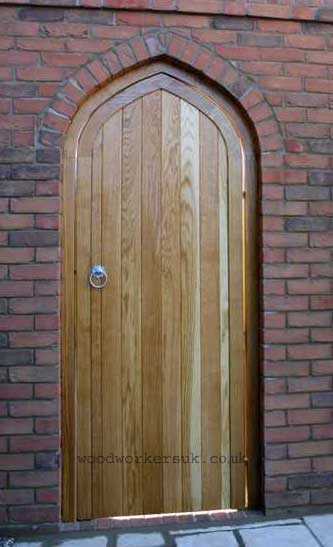 The Tudor arched gate is made to measure in overall widths up to 3ft 6/ 1016mm wide. 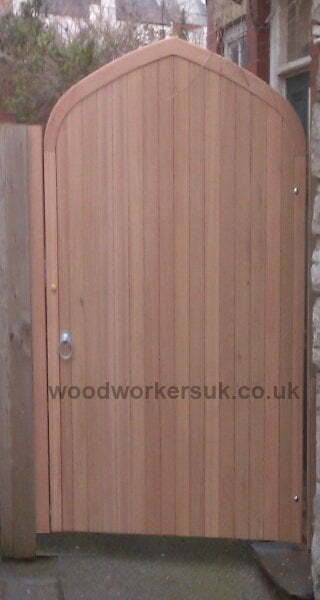 Tudor arched gate with matching frame in Euro Oak. Please click to enlarge. Rear view of our Tudor arched gates click to enlarge! Get a quote on a shiny new one by clicking here! All top edges on any horizontal rails of the Tudor arched gate feature an angled water run off, this stops the build up of moisture on your gates and makes for a longer lifespan. The stiles of the Tudor gates (vertical outer uprights of the gate frame) also have rounded outer edges. Not feeling very regal or want an alternative arched gate? The Tudor arch guide prices are based on a single gate 6ft high x 3ft overall wide (approx 1830mm high x 915mm wide), these are NOT from prices, smaller gates will be more economical etc – contact us for a price! All prices are correct time of insertion and are EX VAT. Free delivery to most parts of the UK mainland is included – exclusions do apply, again please contact us. Want to go all Tudor with one of our gates? To get a personalised costing on our Tudor arched gates please use the form below. Please include the height and width of gate (or opening) and any other information you think we may need to know.